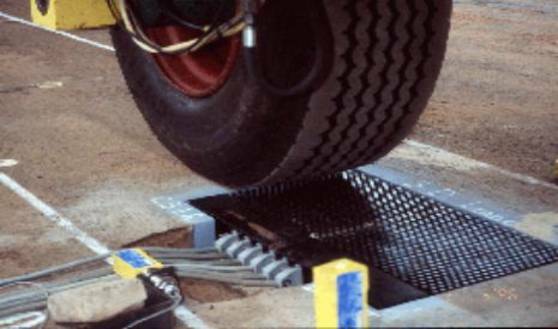 Researchers at the CSIR have developed a Vehicle-Road Surface Pressure Transducer Array (VRSPTA) system to measure tyre/road interface stresses under a moving pneumatic wheel load, including that of an aircraft. This unique system simultaneously measures the vertical, transverse and longitudinal vehicle tyre/road interface stresses - some of the most important inputs into pavement design for optimising the cost of roads over their design life. This technology is referred to as the Stress - In - Motion (SIM) technology. 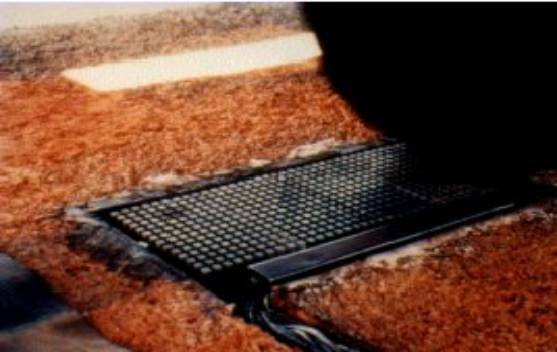 The various SIM system consists of an array of calibrated strain-gauged steel pins fixed to a steel base-plate buried in the surface of the road. These load cell pins are installed at right angles to the direction of travel. The strain outputs from these pins are scanned at a high rate while the wheel traverses the pins, giving an indication of the vertical, transverse and longitudinal loads acting on each pin. The system is approximately 750 mm long by 360 mm wide and 108 mm high, and the tyre loads and load distributions are measured over the complete tyre contact area. Often, and certainly in southern Africa, the cost of the asphalt layers dominates the cost of road construction and maintenance. Therefore, it is important to design towards an optimum asphalt layer thickness in relation to the supporting road structure, and the expected axle loading and tyre pressures for a particular road. Usually static uniform tyre contact stress distribution is assumed to simulate tyre/road interface vertical stresses as input towards the design and evaluation of the road structure. While this approach maybe adequate for relatively thick (>75 mm) asphalt surfacing and base layers, it is highly inaccurate for thinner layers. Horizontal tensile strains resulting from a non-uniform stress distribution can be up to 100 per cent higher than with a uniform stress distribution, indicating the potential of premature failure of the asphalt surfacing. For thicker asphalt layers the potential for permanent (plastic) deformation is also closely related to actual tyre/road contact stresses. It is therefore critical to ensure the accurate quantification of the actual stresses at the tyre/road interface. To this end, the accelerated pavement testing (APT) programme at the CSIR included the experimental design of the Vehicle-Road Surface Pressure Transducer Array (VRSPTA) system. The first prototype (VRSPTA Mark I) was developed in association with the Laboratory of Advanced Engineering (Pty) Ltd (LGI), Centre for Structural Mechanics, University of Pretoria. The CSIR then upgraded the system to a stand-alone unit (VRSPTA Mark II), which simultaneously measures stresses in the three directions and acquires data for wheel speeds up to 10 km/h. Further development lead to a 4-pad VRSPTA Mark III system which is able to measure the full axle of real world trucks. “Towards improved mechanistic design of thin asphalt layer surfacings based on actual type/pavement contact stress-in-motion data in South Africa” by De Beer M, Kannemeyer L and Fischer C.
Initial results from the VRSPTA systems indicate that, in extreme cases, the tyre side wall vertical stresses can be twice as high as the tyre inflation pressure, and that the maximum transverse stresses can exceed the inflation pressure by as much as 27 per cent. The maximum longitudinal stresses appear to be the lowest of the three stresses - at maximum only 30 percent of the tyre inflation pressure. The results appear to be promising in evaluating tyre/road interface stress patterns with the current VRSPTA systems and have proved the viability of the SIM concept.